GIFs are short moving pictures on a loop. They are fun to use and become popular across many platforms like Facebook, Twitter and Tumblr. Twitter has bring the feature of built-in GIF sharing since 2016. You can easily download GIFs by the right-click-and-save method on most websites. However, this doesn’t work on Twitter, because it will automatically convert uploaded animated GIFs into short .mp4 video files to increase load times. That’s why you cannot save GIFs from Twitter directly as you normally do. So now the question arise, how to save GIFs from Twitter? How to bypass the restrictions imposed by Twitter? If you’re looking to learn how to save animated GIFs from Twitter, you’ve come to the right place. In this article, we will guide you to learn the ways to download and save funny GIFs from Twitter on your iPhone/iPad, Android and computer. For iOS users, to save GIFs from Twitter on iPhone or iPad, just download and install a free app called GIFwrapped. 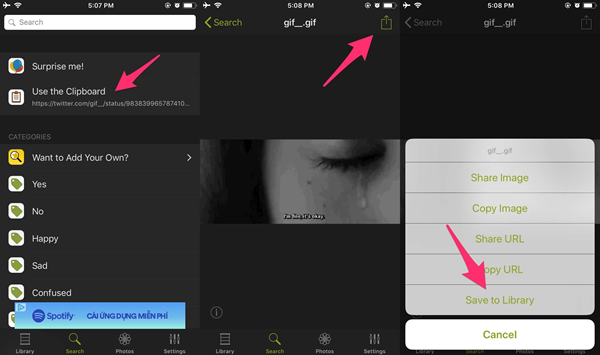 It is a handy GIF downloader for iOS and works pretty well in helping users to download GIFs from the micro-blogging app like Twitter. This app connects directly to your Twitter account and allows you to save GIFs in the GIFwrapped vault, and sync your collection to Dropbox. Open the Twitter app on your iPhone or iPad, and head over to the tweet containing the GIF you want to save. Then tap on the Share button. Select “Share Tweet via…” and then tap on “Copy link to Tweet”. You will get a notification that the link to tweet had been copied to the clipboard. Now open the GIFwrapped app and select the Search tab. Then tap on “Use the Clipboard” option, you will see the GIF file. Tap on the GIF file and select the Share button at the top right corner. Then tap on “Save to Library” to save the animated GIF to the Camera Roll. Thanks to the open nature of Android operating system, there are quite a few apps available on the Google Play Store that allow us to download GIFs from Twitter. In this article we’d like to recommend Tweet2gif. This app provides a very easy and convenient way to save GIFs from Twitter on Android device. It is free and works exactly the same like GIFWrapped. 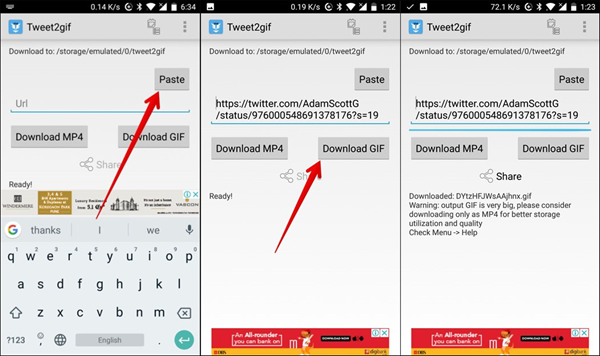 Launch the Twitter app on your Android device and find the GIF you want to save. Then select “Copy link to Tweet” in the tweet’s upper-right corner menu. Once you’ve copied the link to the clipboard, head over to the Tweet2gif app and click “Paste” to paste in the link. Then click “Download”. You can choose to download it either as a GIF or as the MP4 video file. Then open your Google Photos t access the saved GIF. If you are looking for downloading GIFs from Twitter on Mac or Windows computer, you’ll have a bit more work to complete the action. Sving GIFs from Twitter is not as simple on the computer as it is on the mobile device. But still, there is a website called EZGIF.com that allows you to download GIFs from Twitter in the form of video on your computer. Open any web browser in your computer and then go to Twitter’s official website. Select the GIF you wish to download and click on the downward arrow on the top right corner. Just select the “Copy link to Tweet” option. Next go to https://ezgif.com/optimize and then paste the tweet link in the “Paste Image URL” field. Now click “Upload” and the GIF file will be downloaded in the form of an MP4 video. Then click on “Save” to store the video on your computer. Well, that’s all to save animated GIFs from Twitter. If you’re a GIF enthusiast, then this post must greatly help you download GIF from Twitter on your iPhone/iPad, Android and computer easily. If you are looking to download videos from Twitter, keep reading this article: Twitter Video Downloader.